As a joint centre of the University of Geneva (UNIGE) and the Graduate Institute of International and Development Studies, our campus comprises Villa Moynier, the Maison de la paix, the Rothschild Building and Uni Mail. All these buildings are accessible to disabled persons. We are headquartered at Villa Moynier, a historic villa surrounded by a beautiful park with a view over Lake Geneva and Mont Blanc. 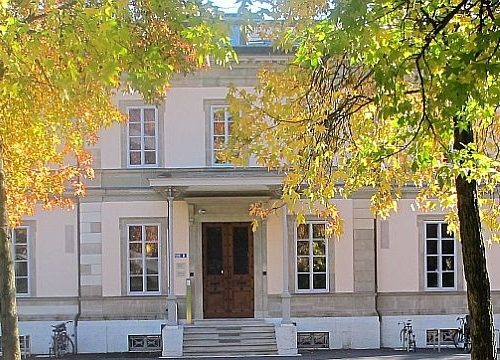 Located near Place des Nations and most international organizations, the Villa houses our Student Office, teaching assistants, administrative staff, research, as well as some events, training and classes for the Executive Master in International Law in Armed Conflict. Located next to Place des Nations, the Maison de la paix is the headquarters of the Graduate Institute of International and Development Studies. Several courses for the LLM in International Humanitarian Law and Human Rights (LLM) and the Master of Advanced Studies in Transitional Justice, Human Rights and the Rule of Law (MTJ) take place here. This is also where we hold many of our events, either at lunchtime or in the evening. Located behind Palais Wilson – the headquarters of the Office of the United Nations High Commissioner for Human Rights (OHCHR) – the Graduate Institute’s Rothschild Building hosts some LLM and MTJ courses. Uni Mail is Switzerland’s most prominent building dedicated to the social sciences. It notably hosts UNIGE’s Law Faculty. Located in downtown Geneva, it is surrounded by pleasant cafes and restaurants and a vibrant cultural life. Some courses for the LLM and the MTJ take place here. Our students have access to the Graduate Institute’s Kathryn and Shelby Cullom Davis Library and all its collections, located at the Maison de la paix. The library covers 4,500m2 over two levels and has 330 workstations. Students also have access to the Uni Mail Library which notably houses UNIGE’s law and international relations collections. The 8,000m2 library, staffed by 50 devoted professionals, extends over the first two floors of the building. The Maison de la paix, Rothschild Building and Uni Mail have cafeterias which serve hot and cold food at subsidized prices for students. Getting around Geneva – by bus, tram, bike or on foot – is an easy task. Distances are short and public transport efficient. Villa Moynier and the Maison de la paix are located in Geneva’s international area, where most international organizations are located. The Rothschild Building is located in Paquis, a vibrant and multicultural neighbourhood near the lake. Uni Mail is situated in downtown Geneva. The Maison de la paix and Rothschild Building are 5–10 minutes’ walk from Villa Moynier. A direct tramline connects Uni Mail to the Maison de la paix and Villa Moynier in 20 minutes (8 stops). Cycling takes approximately the same time. We organize online information sessions for prospective students as well as for students who have been accepted to our programmes.